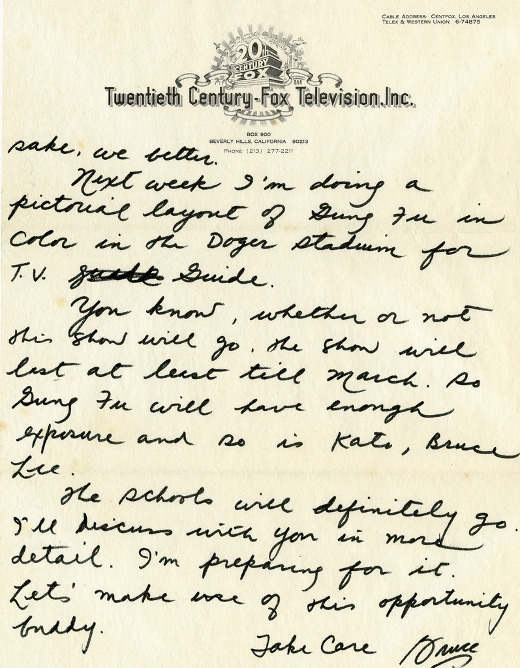 In November of 1966, ever the optimist, Bruce Lee wrote the following letter to one of his students, Taky Kimura. Early ratings for The Green Hornet - his first acting role in front of U.S. audiences - had proven to be disappointing, however Lee was well aware that the exposure from just a single season as Kato would suffice in his quest to bring his Jun Fan Gung Fu ('Bruce Lee's Kung Fu') schools to the masses. The next year, with the show cancelled but his star rising, Lee founded Jeet Kune Do ('Way of the Intercepting Fist'). Recommended reading: Letters of the Dragon: Correspondence, 1958 - 1973. 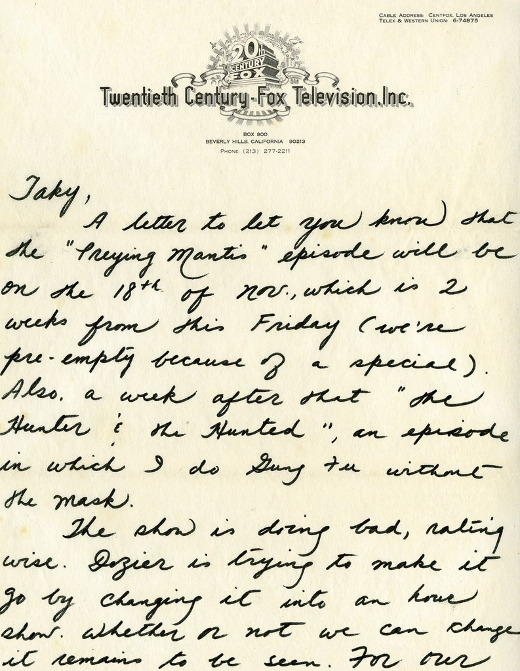 A letter to let you know that the "Preying Mantis" episode will be on the 18th of Nov., which is 2 weeks from this Friday (we're pre-empty because of a special). Also, a week after that "The Hunter & the Hunted", an episode in which I do Gung Fu without the mask. The show is doing bad, rating wise. Dozier is trying to make it go by changing it into an hour show. Whether or not we can change it remains to be seen. For our sake, we better. Next week I'm doing a pictorial layout of Gung Fu in color in the Doger Stadium for T.V. Guide. You know, whether or not this show will go, the show will last at least till March. So Gung Fu will have enough exposure and so is Kato, Bruce Lee. The schools will definitely go. I’ll discuss with you in more detail. I'm preparing for it. Let's make use of this opportunity buddy.